Note: Images show pinlock insert lens installed in face shields. I just switched helmets to a non pinlock model and I miss it already. This was easy to install and worked great! Didn't have any fogging in cold weather or in the rain. I was having issues with my visor digging up in the winter. Using this I have no issues. Bought this for HJC IS Max2. Installs easily, works as advertised and no more foggy shield! I ride year round in New York. Winter months always gave me fogging issues. I finally upgraded to a pinlock ready helmet and ordered this pinlock. It works 100% perfect at stopping fog. I literally cannot fog the lens with the pinlock installed. Bought this to stop my face shield from fogging up in my morning commute; it did the job. Install is easy and quick and results amazing. I have 3 helmets set up with this face shield. All three cracked at the pin-lock posts with in 30 days. Started out as a spider web looking crack and started to spread from there. After 4 months the pin-lock post just fell out. It’s a weak spot in the face shield. There’s got to be a better way to engineer that post into the face shield. Limited options so I’ll have to buy again as long as these awesom HJC helmets last. The pinlock shield is the best money you will ever spend on your motorcycle never have to ride with your shield open again in the rain or cold. This shield will not fog up period. I won't ride in the winter without Pinlock on my face shield. I chose this so that I wouldn't have to worry about packing a second shield or changing between my regular glasses and sunglasses or contacts. Cold weather is coming and good ratings. I'd never used a pin lock system before I must say it works as advertised. But the edges do occasionally interfere with line of sight, not enough to be an issue. Just something to be aware of. great insert worked great for a season than the little grove for installation starting falling apart after removing a couple of times. I needed it for my helmet. I chose the bright yellow insert because recently I took an 1800 mile trip and wore yellow lenses under my helmet and loved the extra brightness/sharpness the yellow gives to your ride and the pinlock shield just seems more convenient than glasses and I am impressed with its anti fog properties as well. Hopefully does a good job of anti-fogging in the rain. Pinlock is the best thing since anything ever for riding in the rainy Pacific Northwest. the smoke has helped me keeping the fog out and also some cooling. i wear prescription glasses so having this actually helps a lot. Tired of Harley branded HJ-11 helmet fogging up on cooler days. Never used one before. Though I would try it out. Needed it for the helmet. Works great. It was a reasonable price and free shipping. This Item stopped all of my Fogging while riding in temps under 20 to 40 degrees. Great Idea works wonderful !! Best purchase I ever made. This thing just won't fog up. Ever!!!!!! I bought the yellow insert for night driving on Texas dark country roads is helps brighten things up. Because I live in Seattle and would not ride without a pinlock system here. I bought it for my HJC Captain America helmet. we get a lot of rain when you don't expect it, and then your face shield fogs up. hope this helps. SADLY, HJC DIDN'T INCLUDE THIS WITH THEIR IMAX-2 HELMET. To help against fogging up lens in cold weather. have a pinlock ready helmet and visors but no insert. No more foggy visor in cold weather. Can ride out with visor all the way down. What is the yellow shield best for? Night vision, etc?? BEST ANSWER: I found the yellow to work very well in all conditions especially at night it seems to bring everything out and really enhances your vision for sure. The yellow insert is best when driving in fog or similar low light conditions. Would not recommend for night use. The yellow shield is great for all around glare reduction in all conditions. Can this anti fog shield fixed on my is max 2? BEST ANSWER: I have a Symax III. I would say Yes, if you have the Pins on your shield. Please call HJC to make sure. They have one of their headquarter locations in Hacienda Heights, CA (Los Angeles County). If you have a pillock ready shield it is set up and ready for this lens insert. Does this work for both the CL-17 AND the CL-17 Plus? - or is there a different size for the plus? BEST ANSWER: I don't know. I would call revzilla and ask which you need. They should have that information. I just bought a CL - 17 with the HJ 09 pinlock insert. YES IT FITS. At first it seemed like the silicon bead wasn't touching the visor, but it settled in and now its perfect. the 2 little pins holding the pinlock can be adjusted with a screwdriver to tighten the seal. Hope this helps! What application, weather, etc... is the yellow shield best for? BEST ANSWER: The yellow shield is best for low light to night time riding. It really helps brighten the road in front of you and I would not be without mine for those times I've been caught out later than I had planned on. 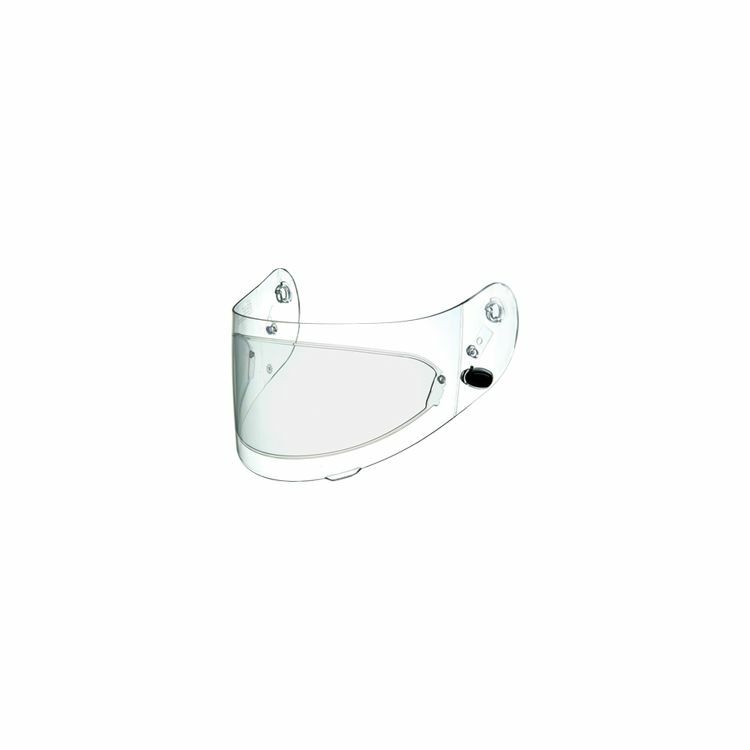 Would I be better with a clear insert on my smoked visor, or a smoked insert on my clear visor? I would reccmmend the clear insert and a smoked visor. They are not easy to change out once it is put on. Clear w smoke allows for day and night riding. Has anyone tried using a tinted shield with a tinted pinlock lens insert? Is it too dark? BEST ANSWER: Yes it is. I live in Cairo, Egypt, and here it gets pretty hot and sunny. Either or does the job here, and both together will render the vision too dark. That is the good thing about the Pinlock lens. You can remove it when it gets too dark. I use a dark smoke shield with a light smoke insert for bright daytime riding. This is the setup I was considering. Do you find visibility diminished? My concern is that the dark smoke shield won't be dark enough for sunny days, but that adding the light smoke insert would make it too dark. will this work with the visor that came on a HJC CL16 'machine' helmet or do i need a different visor? BEST ANSWER: If you have a pin lock visor, it should work. You must have a visor that has the pins attached. This is an excellent system, which I have had no problems with, or any fogging of the lens. Does this product include Pinlock pins so that the lens can be installed by drilling holes in HJ-09 shields that are not Pinlock ready? BEST ANSWER: The HJC HJ-09 Pinlock Lens is the lens only, it does not come with pins. The Pins are attached to the face shield. We would not recommend drilling holes your shield (not at all. Not even a little bit) as it will compromise the integrity of the product. Will these inserts fit on my HJC FG-17 pinlock visor? What is the advantage of the pined shield if i use a clear shield and clear insert? BEST ANSWER: The "insert" , or Pinlock Lens, will keep your shield from fogging. I use the clear shield with the clear Pinlock and it works well. i use a clear shield and insert for cold weather it is perfect for preventing fog buildup on the shield. The advantage is the no fog feature. If you use a clear insert or a tinted insert or a clear or tinted shield - no fog is what you need. I have used the Pinlock insert for two years and ride in temps. down to 10 degrees F and it works! Pin lock inserts do a great job of keeping the visor from fogging up. In daylight I personally like the dark smoke. At night I think amber is too darkening to see well. I use the clear at night and in bad weather. It will not fog up at all. I used my pinlock in 30 degree weather and absolutely no fogging of my face shield. It's a wonderful thing. As other have said, a clear installed on a clear will cure the fogging of the helmet's shield like no other product. The pin system is supposed to stop fogging of the lens in conditions such as rain, cold and high humidity.